Bellin -Carte de l'Isle de la Jamaique. Bellin, J. N. - Carte de l'Isle de la Jamaique. Carte de l'Isle de la Jamaique. - Bellin, J. N.
Title : Carte de l'Isle de la Jamaique..
Map maker : Bellin, J. N.. Size : 8.1 x 12.5 inches. / 20.7 x 31.8 cm. 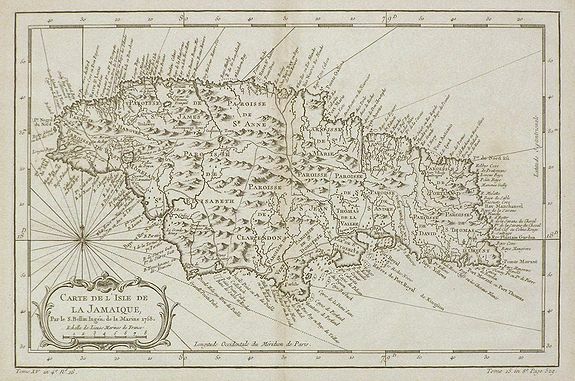 Description :Nice small of Jamaica with many coastal details, reflecting Bellin's position as Ingénieur Hydrographe to the French king. Major anchorages are shown, accompanied by depth soundings and indications of shallows and sandbanks. Interior features include mountains, rivers, roadways, towns and villages, as well as smaller settlements that are located but not named. The map demonstrates the accuracy of detail and fine engraving for which Bellin is known. Condition : Very Good, with light toning, somewhat stronger along the centerfold.